Can’t find time to brew? Yeah, we’ve all been there. From that sneering, 2-month-old yeast starter languishing in the fridge, to the perfect Oktoberfest recipe wistfully begging to be brewed as July turns to August, it’s just one of those aggravations of homebrewing. If that obstacle stares you down more often than not, then consider browsing Speed Brewing ($19.99, Voyageur Press). The author presents a fresh, novel approach to brewing within limited time frames and offers hope and inspiration to those who can’t fathom abandoning their beloved hobby. The theme throughout the book is one of pragmatism, small batches, minimalist equipment and low-gravity brewing, but also one of ingenuity and resourcefulness, because, after all, necessity is the mother of fermentation. All of which is designed to cut significantly into the time and effort needed to keep the beers flowing. 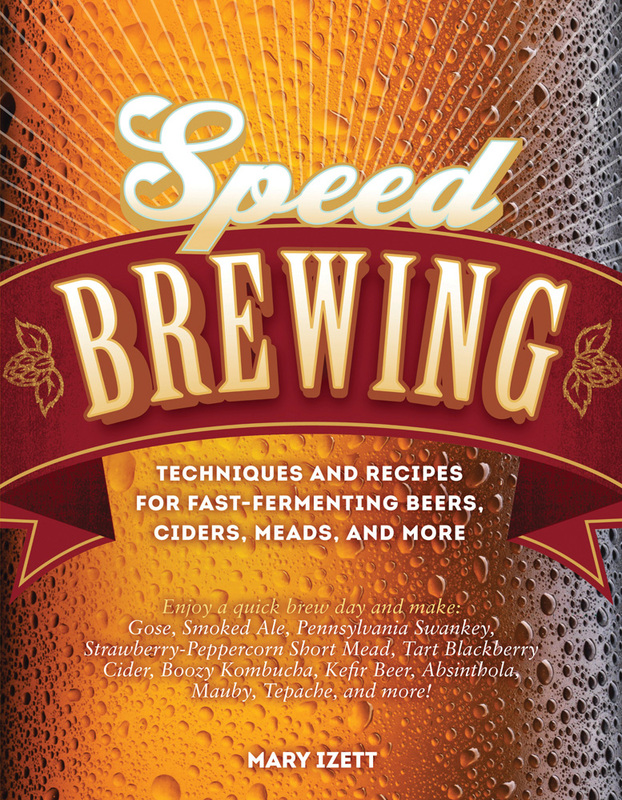 Speed Brewing is composed of seven chapters, starting with an extensive, informative primer on the basics of ingredients, equipment and packaging. Useful, since this book could easily double as a novice homebrew launching pad that ties nicely into the rest of the book. It’s not simply a beer book: The remaining six chapters cover a splendid variety of beverages, each section concentrating on a specific realm of fermentation. “Brisk Beer” leads off the lineup, followed by “Short Mead,” “City Cider”, “Bucha and Kefir Beer,” “Spirited Soda” and finally, “Far-Flung Ferments.” Each chapter contains a few recipes, some of which are pretty straightforward, but it is Izett’s knack for creative thinking with respect to recipe design that impresses. Even wizened traditional homebrewers, with plenty of time to brew, can learn a few things from this book. Her core beer method is dubbed “Brew in a Bag (BIAG)” and involves all-grain brewing by steep mashing in a mesh bag, followed by draining the contents into the kettle. Sparging is optional, but brewing is executed normally from that point on. All beer recipes are 2 gallons, so a stove-top and 3-gallon kettle are all that is needed. Nifty, effective and expeditious. All nonbeer recipes are designed to make 1 gallon, and since they don’t require mashing, are even easier to execute. The “Bucha and Kefir,” “Spirited Soda” and “Far-Flung Ferments” (global indigenous beers) are quite interesting chapters, covering unusual ferments seldom considered among homebrewers. Izett’s spirit is one of practical, yet unfettered experimentation, and she never loses sight of her premise, brewing without creative boundaries, but within time constraints. This book also holds value as an outline for pilot brews and a means to keep an eclectic mixture of ferments on hand, a legitimate horizon-expander for any brewer. All recipes could easily be scaled to larger volumes. The wealth of general knowledge in the text, including numerous tables, rivals that of many other brewing books. Speed Brewing is certainly an untapped and thoroughly enjoyable approach that promises to keep the brewing gears turning for those who might otherwise have a tough time finding time to brew.